A Christian fundamentalist with a deep hatred of multiculturalism will be responsible for the worst terrorist atrocities in Norway’s history. How could Norway produce such a guy? Anders Behring Breivik is born in London on 13 February 1979. His father, Jens Breivik, is based in London and works as a diplomat for the Norwegian Embassy. His mother, Wenche Behring, works as a nurse. Within a year of Breivik’s birth the couple separate. Wenche takes her son back to Norway and brings him up with her daughter from a previous marriage. During Breivik’s young life he’s taken back and forth to see his father in London. But in 1983 his father marries for a third time and the newly-wed couple are subsequently posted to the Norwegian Embassy in Paris. Around the same time in Oslo, a four year old Breivik risks being taken away from his mother, as the Norwegian childcare authorities deem her unfit to look after him. 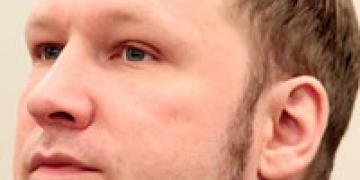 Jens Breivik applies for custody of his son, but is refused. At six-years-old and still living with his mother, Breivik is becoming more and more unruly and aggressive in the classroom. His unsettled background isn’t helping his behaviour. However, he still continues to visit his father and step-mother in France, and enjoys staying at their apartment and holiday home in Normandy. Unfortunately his father’s third marriage breaks down in 1991, and this also coincides with Breivik going off the rails. As a teenager he’s rebellious and enjoys being a graffiti artist. He takes it very seriously but ends up being caught by the police. When his father finds out he’s been arrested, it’s the last straw and he decides to cut all ties with him. Breivik, angry with his father for a string of failed marriages, also stops all contact, although he does call his father a few times over the intervening years. At 15-years-old Breivik makes a powerful statement by turning to God and is confirmed into the Lutheran Church of Norway. By this time he’s becoming passionately obsessed about an imminent Muslim takeover of Europe. As a result of his beliefs he tries to enrol into the Norwegian Army but is rejected after he’s found to be unfit for military service. As the new millennium begins Breivik decides to act. Eleven years later Norway will witness the worst terrorist atrocities ever seen in the country.